The "Birds in Art" at the McClung Museum was fascinating from the art works to the worksheet for children. 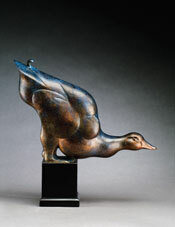 The exhibition interprets birds in oil, watercolor, the graphic arts, bronze, wood and stone. The pieces reveal the bird as portrait, as being affected by humans, fierce birds in nature. The large sculpture showing a dead crow made of old automobile tires was fascinating. Mark Eberhard's painting "On The Edge" showing birds on the edge of extinction was very effective. The worksheet for children was just outstanding. There was a great explanation the art terms of addition or subtraction in making sculpture in reference to art in the exhibition. There were games and areas to draw, maps and information. This is a great addition for children of all ages.